Infinity Halo Diamond Wedding Set with Pave Setting | Shane Co. This bold and flashy split shank infinity halo wedding set is crafted in quality 14 karat white gold in a swirl design. One hundred and ten round pavé-set diamonds, at approximately .57 carat total weight, will provide ample sparkle for the center diamond of your choice at approximately 1.00 carat. Completely obsessed with my ring! My fiancé and I picked out this ring together and I couldn't be more in love with it! I kept saying "I just want a ring that sparkles." All rings sparkle under the perfectly set lighting inside the jewelry store but many don't once you leave the store. That is not the case with this ring! It is absolutely stunning in every lighting. I really am amazed at the sparkle it has. It's absolutely the most perfect ring and I just cannot take my eyes off of it. Thank you Shane Co for making my dreams come true with this beauty!! I purchased this wedding set along with a .59-ct Shane Classic round cut diamond with SI1 clarity and H color. It looks absolutely stunning! My fiance loves her ring and can't stop staring at it. 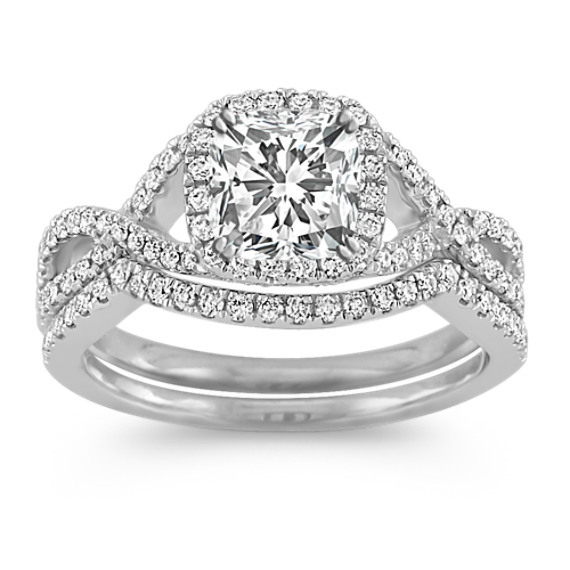 Get a round diamond with this one because the shape of the halo makes the diamond look bigger!